We find this species one of the most floriferous of the Phalaenopsis species with clusters of perfumed flowers produced all at once on flower spikes that persist and re-flower for several years (don’t cut off the flower spikes of this species when the flowers drop). 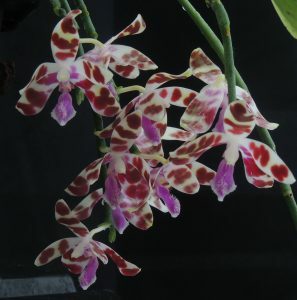 Phalaenopsis mariae is native to the Philippines and Borneo where it grows as an epiphyte in warm forest in shade. During the summer it produces pendulous flower spikes. We grow the species in our Warm Asia section (min 17C) but it would appreciate growing a little warmer.